This lively, family-run pub with en suite rooms is a 15-minute walk from the Brodick ferry terminal on the Isle of Arran in Scotland. Built originally as a holiday home for the wealthy London artist George Hering, Ormidale has been owned and run as a hotel, by the Gilmore family, since 1935. 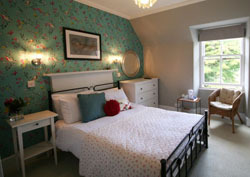 Our lovely rooms all have en suite bathrooms, flat screen TVs, and tea and coffee making facilities. Breakfast is a real treat at Ormidale. 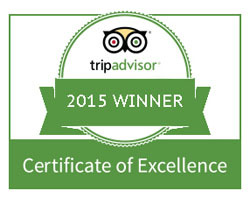 Our traditional full Scottish breakfasts are cooked individually to your order and included with the room rate. Choose from a selection from Creelers kippers to our delicious homemade Granola. The bar is very much the locals’ choice for a drink in the village but visitors are equally made to feel at home. We are CAMRA recommended and sell local beers and stock many malt whiskies, including, of course, a range from the Island’s own distillery. Home cooked pub meals are available from the bar in the evenings. There's also a beer garden plus children's play area set in our wooded grounds. Different entertainment is offered most evenings including quizzes, live music and our legendary discos held in the glass house at weekends. If you haven't been to an Ormidale Disco you haven't lived! Mid-weekers have a quieter time, whilst at the weekend some of the rooms can get noisy while the Islands nightlife dances in the glass house. The Ormidale hotel has a relaxed and friendly atmosphere and is a good location for hillwalkers, golfers and families. We have a lovely beer garden with stunning views across Brodick Bay to the magnificent Goat Fell massif. We are surrounded by woodland and even have some rope swings to keep the kids busy. Free WiFi is available in public areas and in most of the rooms. The Ormidale is next to the sports pavilion with its all weather football pitch and skate park. Brodick golf course is a mere 5 minute walk from the hotel. We are a 15 minute walk from the ferry terminal and have plenty of free parking. Well behaved dogs are welcome in our bar and to stay in our rooms too! Email: reception(at)ormidale-hotel.co.uk please replace (at) with the @ symbol - this is to prevent automatic junk email.